The following text was written by Michael Korn as an article that appeared in the October – December 1990 edition of the Historical Model Railway Society (HMRS) Journal (Volume 13, number 12). Reproduced by kind permission of the HMRS. Persons wishing to proceed to the trains must be on the platform waiting for the arrival of the trains timed to stop at these places. The guard will issue the tickets and each person is requested to have the exact amount of fare ready. Four trains in each direction every weekday (there was no Sunday service) were timed to stop at Bricket Wood and Park Street. 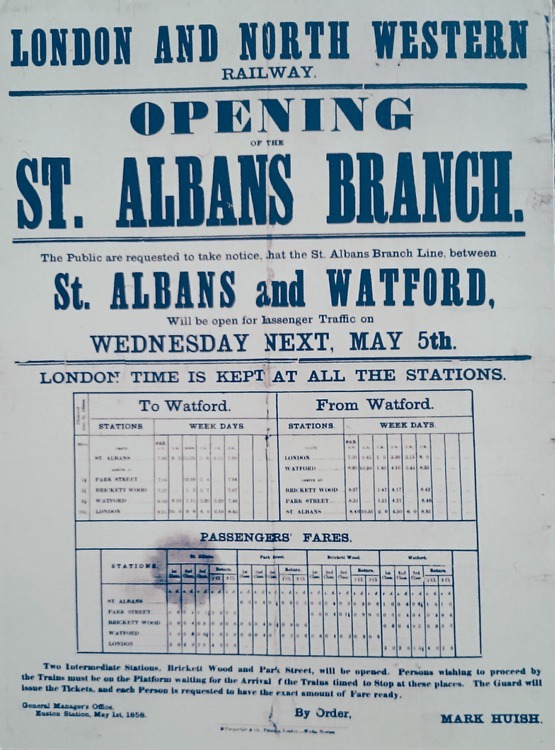 Poster from 1858 advertising the opening of the Watford to St Albans branch. 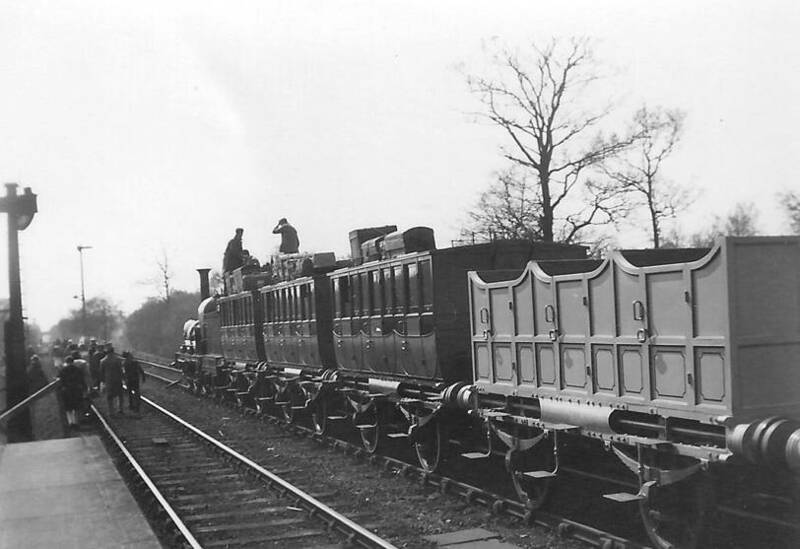 At the beginning of June 1858, changes were made to the timetable so that six weekday trains and two Sunday trains now stopped at Bricket Wood. Park Street station, which had been located at Watling Street, was closed. 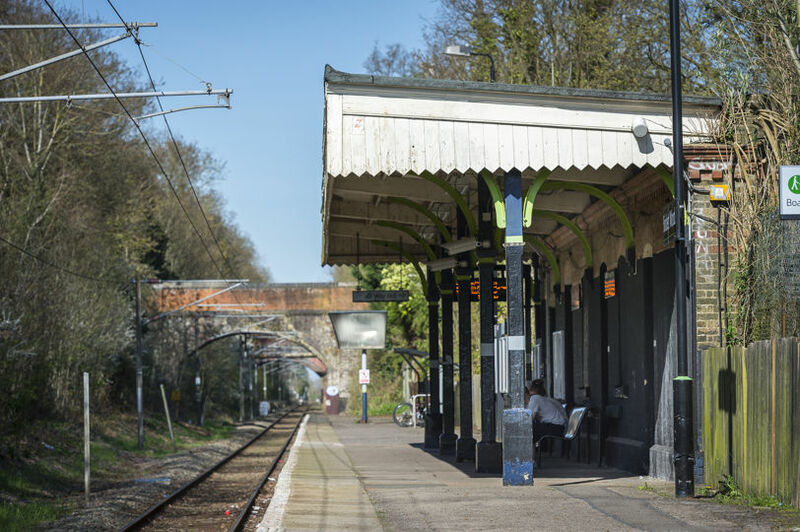 It would appear that there was not enough passenger traffic to warrant stations at both Park Street and Bricket Wood and so in the same month a public meeting was held to determine the location of a station that could serve both communities. 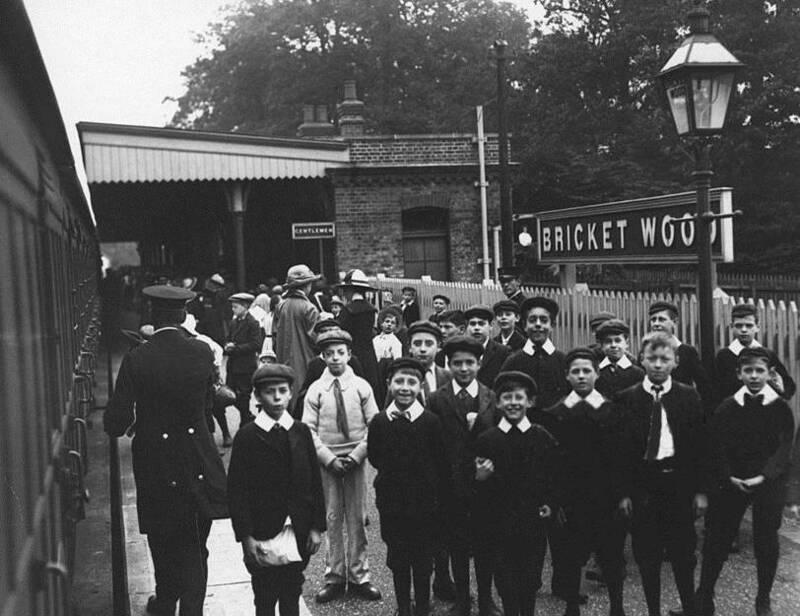 Bricket Wood residents were keen to stay their station stay where it was, but in the end the LNWR decided that a new station would be built next to Slowman’s Farm, Hyde Lane, where there was a level crossing. Situated a third of a mile from the centre of Park Street village, the new station was termed ‘convenient’ for residents of both Colney Street and Bricket Wood. Park Street station thus re-opened in is new location on August 1st, 1858, and Bricket Wood station was closed except for picnic parties and other excursion traffic. All that was required was a few hours’ notice given to the stationmaster at St. Alban’s (sic). Fares were the same as those to Park Street. 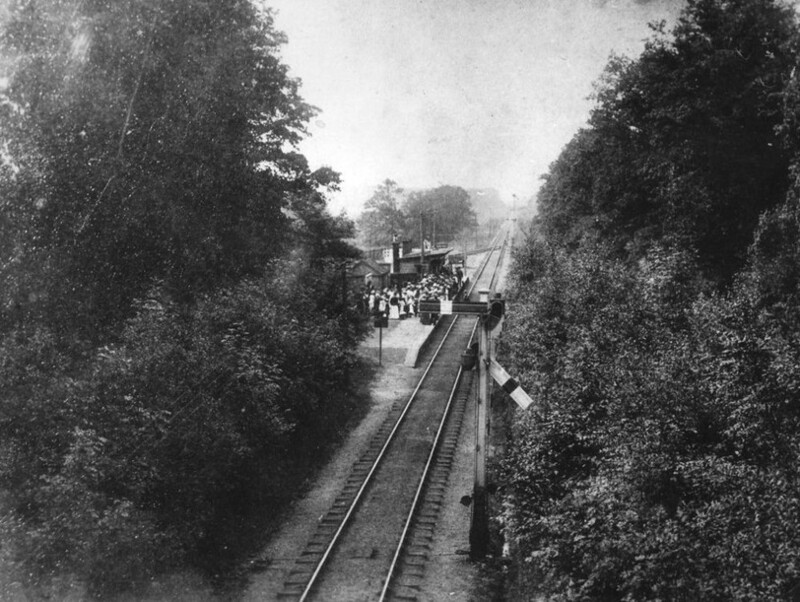 Residents of Bricket Wood were obviously not happy with this arrangement as local pressure appears to have forced the LNWR to reopen Bricket Wood in July 1861. 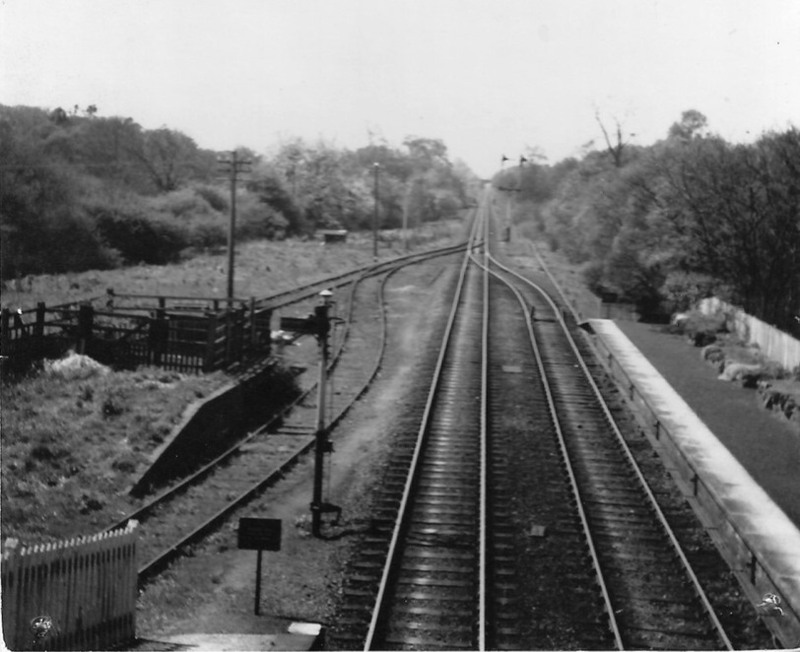 Although fares were initially collected on the train by a guard, the Branch Line Committee responsible for looking after the line’s finances were not very happy with the arrangement, as it gave ‘facility for fraud and robbery’. Plans for a cottage and booking office were thus submitted and the possibility of having platelayers’ wives acting as booking clerks was also considered. An 1872 1:2500 Ordnance Survey map of Bricket Wood station indicates a short platform of about 220 feet in length, with waiting room facilities. The latter was of standard LNWR wooden construction and saw use until about 1903/4. The building comprised a general waiting room, a gentlemen’s waiting room and a ‘gents’. It measured 66ft by 7ft. There was also a short canopy along the length of the building (excluding the gents), on the platform side. The station goods yard was served by a single siding with a small turntable that controlled a short length of track that ran at 90° to the siding. Coal traffic to the yard was operated by Thomas Kentish, ho was the first publican of The Fox and Hounds, located opposite the station. Signals were employed on the line and one can only assume that they were controlled from a ground frame near, or at, the station. An interesting view of the original wooden station building c. 1890, which was situated a few yards to the north of the later, brick-built structure. 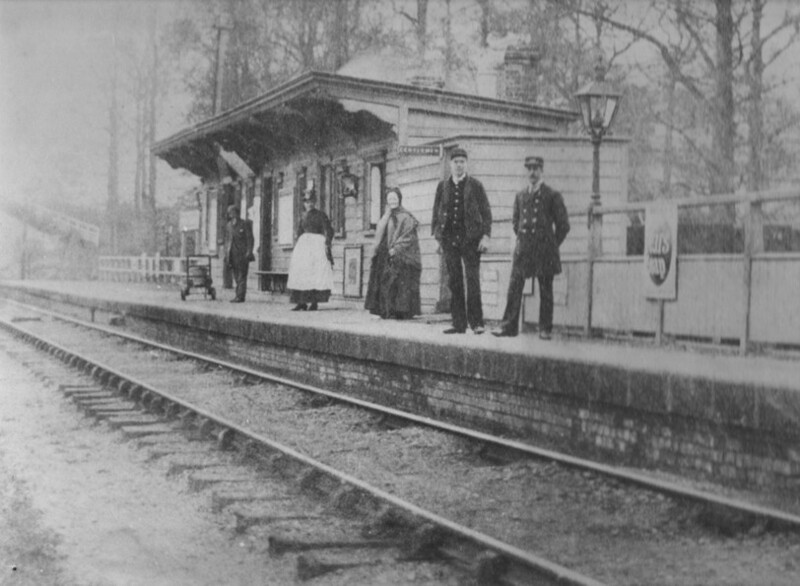 The earliest photo of the station found so far – 1890. Here can be seen the original wooden station building and what appears to be a trainload of excursionists. In an 1890 photograph a short, low platform of about 2ft 3in height, a wooden booking office, two small sheds, a loading gauge, two sidings and possibly a cattle dock are all visible. Cattle were loaded into wagons at the station and were either taken to London, Watford or St Albans. Before the coming of the railway, drovers had driven their cattle along the many tracks that crossed Bricket Wood Common on their way to Smithfield market. 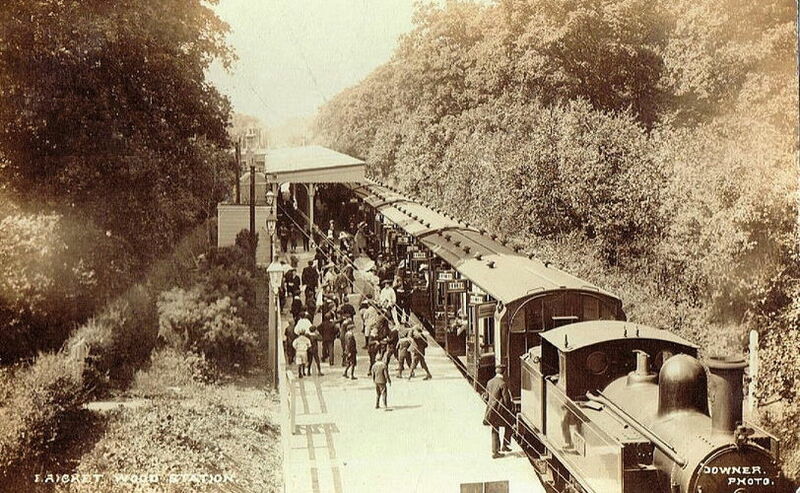 With the advent of rail facilities at Bricket Wood, cattle were gathered at Pound Green. A slightly blurry but nonetheless useful photo of the small goods yard in 1953, looking towards Watford. Note the cattle dock, used to tranship Miss Yule’s racehorses. The railway was also to become an important employer for several local people. Sir Harold Hibbert, brother of Lord Knutsford who lived at Munden House near Bricket Wood, was a dignitary of the LNWR and apparently a word in the ear of one of the domestic staff or an estate worker was usually sufficient to gain employment with the railway company. It was around the end of the century that the fair at Woodside opened, an event that was to have a major impact on the station’s development. Henry Gray and his brother Fred, the owners of the fair, first came to Bricket Wood on a cycling tour from North London in 1887. They bought a small cottage on Smug Oak Green and started serving teas. In 1891 Woodside was built, to be followed by a bakery and shop. Henry Gray married two years later and during the summer months his wife, his parents and two sisters, as well as a number of local people were employed in serving visitors. The fair boasted a miniature railway, a bicycle roundabout and a steam-driven ‘horses’ roundabout, swingboats, a joywheel, a helter-skelter, horse rides and wagonette trips, races and games. A fabulous period photo of the original wooden station building in 1895, a train load of excursionists appears to have just arrived and presumably making their way to Henry Gray’s funfair ‘Woodside’. Within a few years the fair had become very popular for Sunday School outings, works’ outings and school parties. 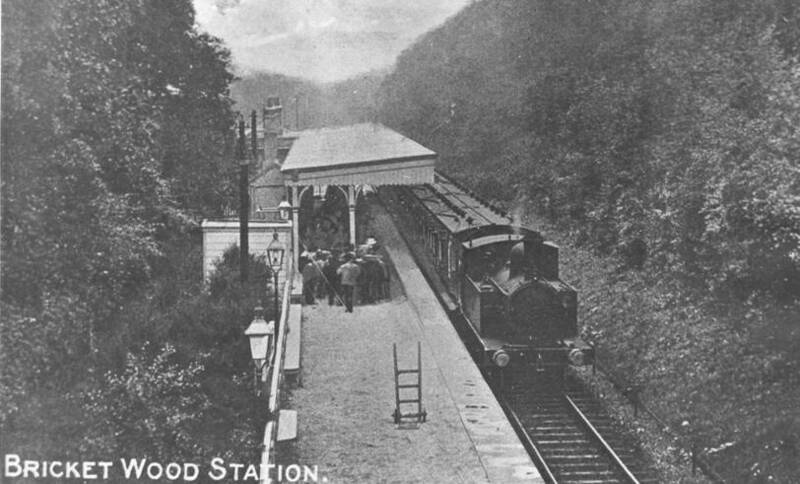 Increased passenger traffic on the railway led to an improvement in service and the rebuilding of the Bricket Wood station in about 1903/4. A new building of yellow brick with a canopy some 200ft in length was constructed on the site of the previous wooden station. The new structure measured 66ft 6ins by 12ft 3ins and, like its predecessor, contained a booking office and general waiting room, ladies’ room, gentlemen’s waiting room (which became the porters’s room at a later date) and a gentlemen’s toilet. The platform was heightened and lengthened so that it was now over 450ft long. The LNWR was, however, in an economy minded mood and the existing goods lock-up and oil store were relocated and existing fences were refixed. Signals were still operated from a lever frame on the platform. It is probable, too, that a new cottage was constructed for the stationmaster around this time next to the bridlepath bridge. Similar in style to the railway employee cottages in St Albans and Park Street, it was soon extended to house two more homes. A fascinating scene, probably from the first decade of the 20th century judging by how new the station building looks (completed 1903), showing boys, perhaps on a Sunday School outing, either waiting to embark or having just disembarked from a train of veteran non-corridor carriages. 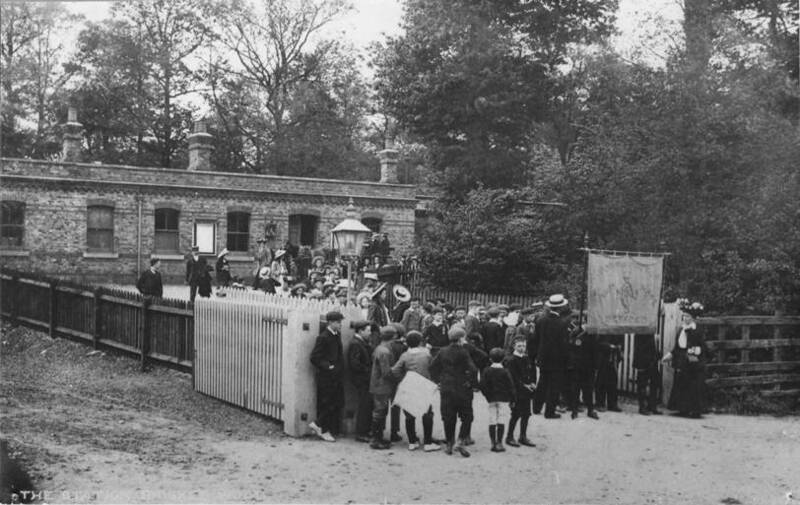 A fabulous period photo of the new brick-built station building in 1908, a train load of excursionists (a Sunday School) appears to have just arrived and presumably making their way to Henry Gray’s funfair ‘Woodside’. An early shot of the new brick-built station building and extended canopy, 1904. An LNWR 2-4-0T has disgorged a load of passengers and waits to take the empty stock forward to St Albans Abbey for stabling, ready to return and pick up the excursionists later in the day. A fabulous period photo of the new brick-built station building and extended canopy in the first decade of the 20th century, a train load of excursionists appears to have just arrived. The locomotive is a well-polished LNWR 4ft 6in tank engine. The improved railway facilities at Bricket Wood also seem to have contributed to the decision to change the main approach to Bucknall’s House (built in 1855 for Mr Henry Creed of St Albans, a Banker and Secretary of the former London and Birmingham Railway) from Garston to Mount Pleasant Lane in order to give easier access to the station. The lodge house, built in 1908, is now No. 1 Bucknall’s Drive. However, even with new facilities the station could not deal with the increasing number of fair-goers. 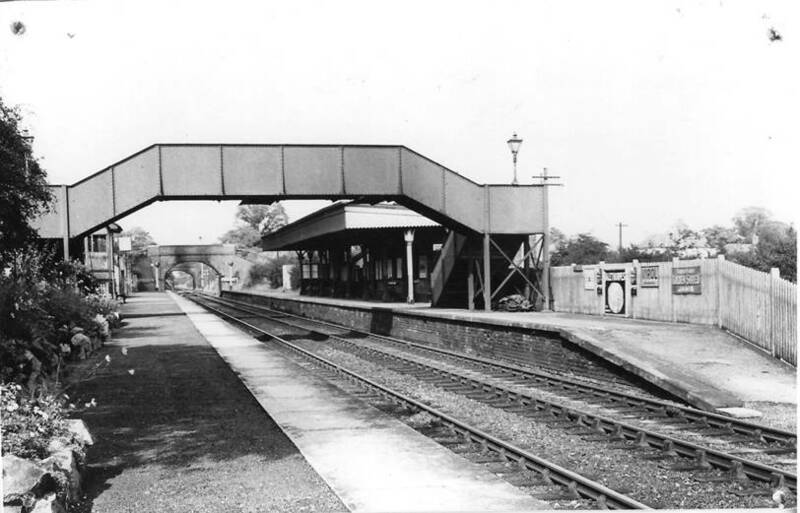 Further building was required and in about 1912 a passing loop, a platform of over 640ft in length, a signal box of eighteen lever capacity, together with a waiting shed and metal overbridge were constructed. As a rule, there was a restriction of seven bogie vehicles or their equivalents on the branch, although trains conveying passengers as far as Bricket Wood only and returning to Watford, or going forward to St Albans goods yard could be made up of 11 bogie vehicles or their equivalents. Some local residents claim that Bricket Wood possessed the longest platform on a single track branch in Britain for a through station. In any event, construction of a passing loop meant that two trains could on the branch at the same time, thereby greatly increasing passenger capacity. 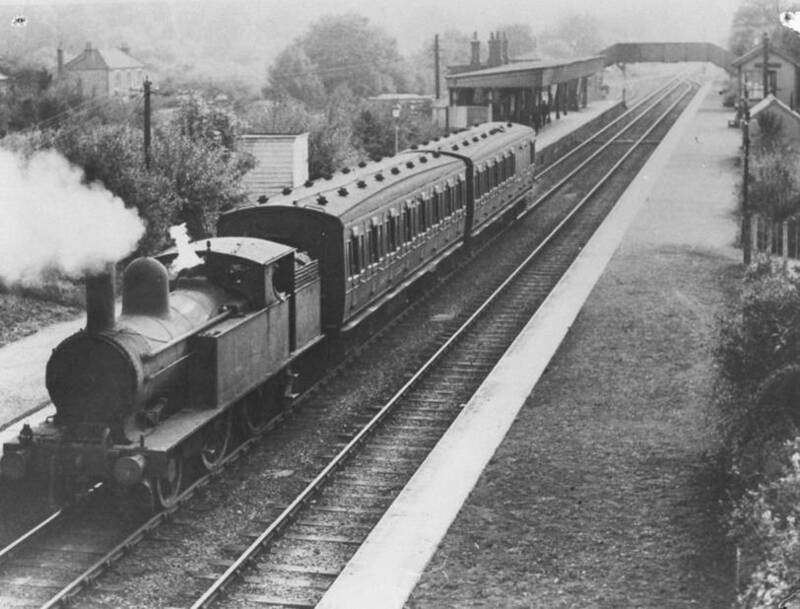 ‘Up’ trains from St Albans were timed to arrive at Bricket Wood one minute ahead of the train from Watford, although one traveller in the late 1940s remembers that it often happened the other way around! 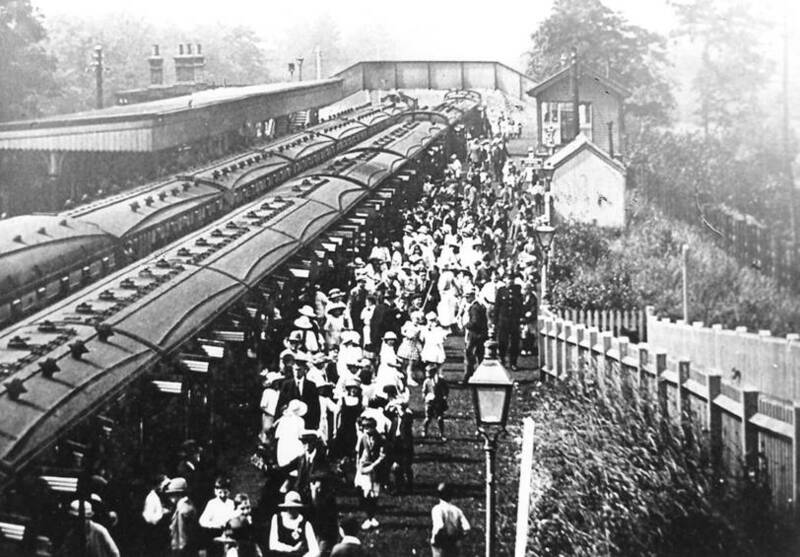 Excursion trains were run from London and in 1910 fares were 1/6d return for adults and 9d return for children. Parties over 500 were 1/4d and 8d per person respectively. Trains were pulled by Webb 2-4-2T engines of which nos 287, 389, 521, 729 and 786 probably saw service on the branch and Webb 0-6-2T engines nos 587, 1057 and 1208. 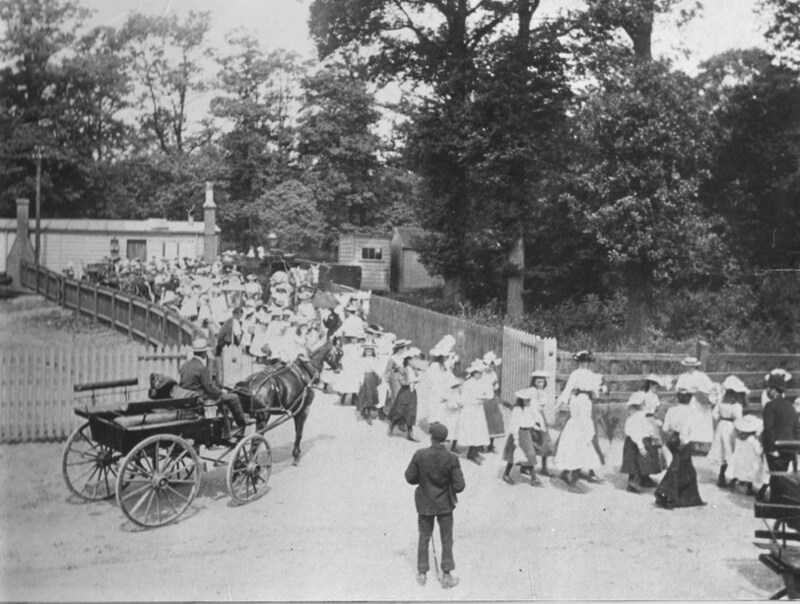 Photographs taken at the time show crowds of people streaming out of carriages onto the platform. A bell, hung from the signal box, was rung to let people at the fair know that there was a train due in. 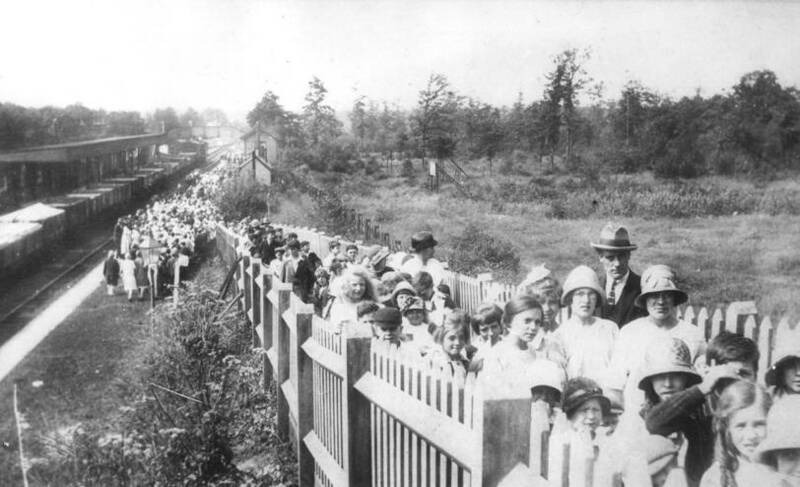 This photo shows the sheer volume of people using the station just prior to the outbreak of the Great War, 1914. This photo shows the sheer volume of people using the station just after the Great War, 1920. Not long after this the local funfairs went into decline and were ultimately closed in 1929. By about 1912 the fair had reached its peak of popularity and the Alexandra tea rooms were serving 5000 teas a day. In addition to the block of refreshment rooms known as the North, South and Abbey rooms, there were seven marquees serving food and drink. The fair opened briefly at Easter and then from Whitsun until September. Maintenance was carried out during the winter months. Enlargements were carried out just prior to the outbreak of the First World War, but during the Great War itself the fair closed down and soldiers were billeted there. Reopening took place in 1919 and in 1923 competition came in the form of another fair known as Joylands operated by Mr R.B. Christmas. Located next to the railway line, Joylands could cater for up to 2000 people and boasted an electric rifle range, boating lake, switch back, roundabouts, cycle racers, mountainslide and tea pavilion. Dinners and tea cost 1/-. This photo shows the sheer volume of people using the station in 1924, just after the second local funfair ‘Joylands’ had opened. However, by 1929 both local funfairs had suffered a steep decline in popularity and had closed. The scrub / woodland behind platform 2 later became the Handley Page housing estate. Joylands could not, however, match the popularity of Gray’s fair and by the mid 1920s Mr Gray could claim that two million people had visited his fair, playing fields and picnic woods. By 1925 fares had increased to 5/- return from London and 11d return from St Albans. As a result, fewer people came to enjoy the 2/- dinners and 1/2d teas (for children dinners were from 3d and teas were 9d). Both fairs closed in 1929 due to declining attendance and the fact that Mr Gray, who was now 66, found the upkeep a heavy burden. The land was purchased by Miss Gladys Yule who was in the process of expanding her estate and the fairs were never reopened. With the end of the fairs another era ended in the station’s life and it settled down to a quiet and unhurried existence. In the early 1920s the station staff comprised five men and working hours were very long. People would often call at the booking office for newspapers and would often gather there for a chat. During the festive season the waiting room was decorated with holly and mistletoe. The cattle dock was probably used up until the time of the Second World War, although Miss Yule’s race-horses were unloaded there until the 1950s. Coal was also delivered to the station yard, but there were no coal staithes as the coal was transferred directly onto lorries. A slightly blurry but nonetheless useful photo of the small goods yard in 1953, seen from the station approach road. Note the 4-wheeled horse box wagon, used to carry Miss Yule’s racehorses. Even after the fairs’ closures the station gardens were kept in immaculate condition and often won prizes. Photographs of them sometimes appeared in the LMS Magazine. 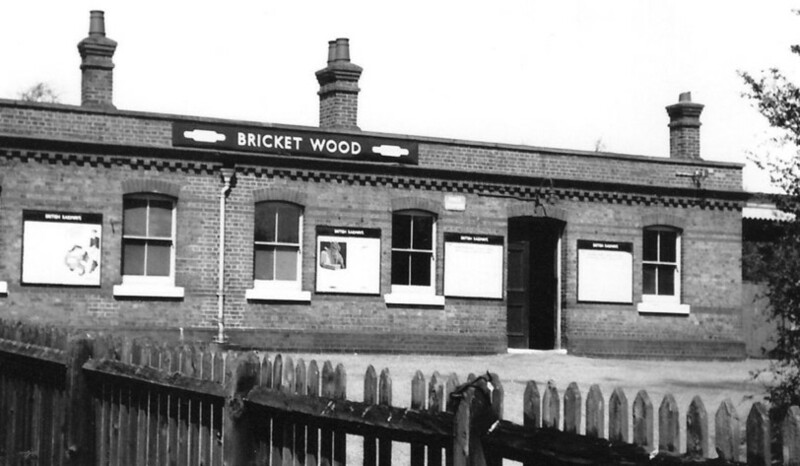 In 1937 Bricket Wood station began its short film career. The Railway Gazette of 4th January 1937 noted that the Liverpool and Manchester Railway engine Lion had been brought from Lime Street, Liverpool, where it was usually kept, for a scene in the film Victoria the Great starring the late Dame Anna Neagle as Queen Victoria. One of the sidings at Bricket Wood was converted to represent Euston station as it appeared in 1840. Filming started on April 28th 1937 and because Lion had no injectors, special arrangements had to be made for the engine to run up and down the branch between normal services to enable the pump to keep the water moving between the tender and the boiler. The extraordinary scene of ex-Liverpool and Manchester locomotive ‘Lion’ and its train of replica carriages taking part in the filming of ‘Victoria the Great’ in 1937. Two actresses in period costumes during filming of ‘Victoria the Great’ in 1937. The station also featured in a number of other films that included such actors as Hattie Jacques, Alfred Marks and Will Hay. One local resident believes that the station was also used in a number of The Saint episodes, starring Roger Moore. 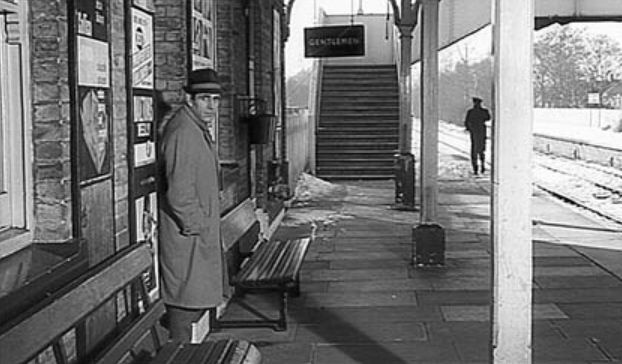 The last film to be made at the station was an ATV production entitled We Thought You’d Like To Be Ceasar. Filming took place on 2nd April 1965 for showing on Easter Monday 19th April. 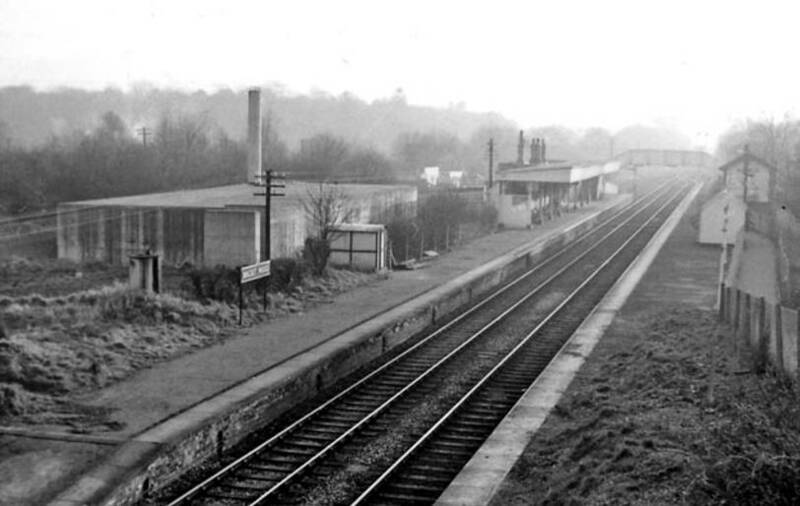 The name of the station was changed to Bassett Wood and apparently little of the station was seen on television. A still frame from the filming of ‘Impact’, though a little blurred this photo is one of the few in existence to give us details of the station furniture, poster boards, windows etc. 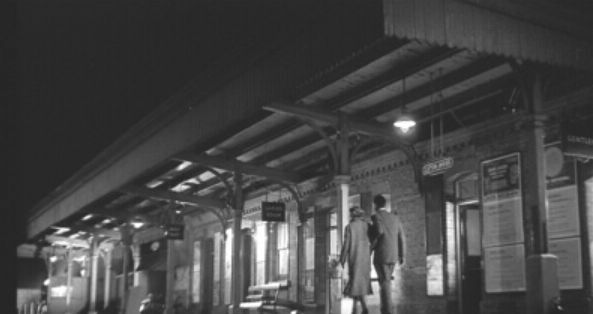 A still frame from the filming of ‘Night of the Demon’, though a little blurred this photo is one of the few in existence to give us details of the station furniture, poster boards, windows and doors etc, and creates a rather atmospheric scene. In this frame “Dr Holden and Joanna leave the scene of Karswell’s death”. 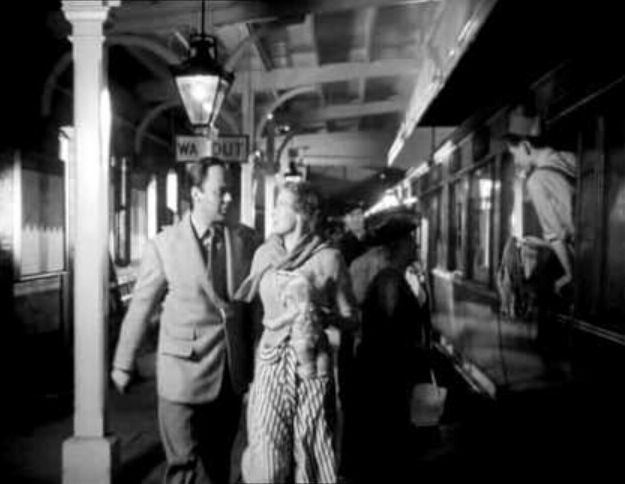 A still frame from the filming of ‘Double Confession’, here we see that, “Jim escorts Anna to the station for her train home and, not wanting to say goodbye, decides to travel with her”. It could almost be ‘Brief Encounter’! 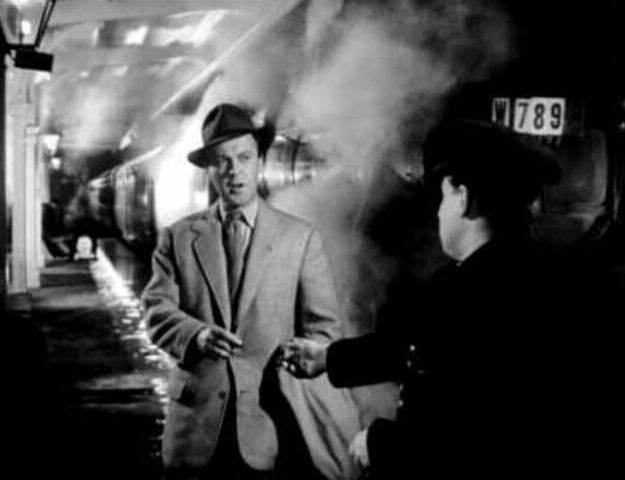 A still frame from the filming of ‘Double Confession’, here we see that, “At 3.30am, the ticket collector (Roy Plomley) asks Jim Medway (Derek Farr) for his ticket as he arrives in Seagate on the mail train”. The branch continued its uneventful existence during and after the Second World War and a Webb 2-4-2T engine, no. 6722, working two coaches: one composite, the other a composite brake with a push/pull end, was a common sight at Bricket Wood. The veteran LNWR coaches had large brass handles on the outside, with none inside the compartment. The Webb tank engines were gradually replaced by Fowler 2-6-2Ts LMS nos 10, 20 and 43, and by the early 1950s Stanier 0-4-4Ts BR nos 41908 and 41909 were brought into service. By the time that steam services on the branch had almost ceased in the late 1950s, Ivatt class 2MT nos 41200 and 41220 had also seen use. What appears to be locomotive 40010 of the Fowler Class 3 2-6-2T arrangement, calls at platform 2. The apparatus to the right of the smokebox allowed it to work in ‘push-pull’ mode, thus removing the need to run the locomotive round the train at either end of the line. The photo appears to be pre-1954 as the nuclear bunker has not yet been constructed. 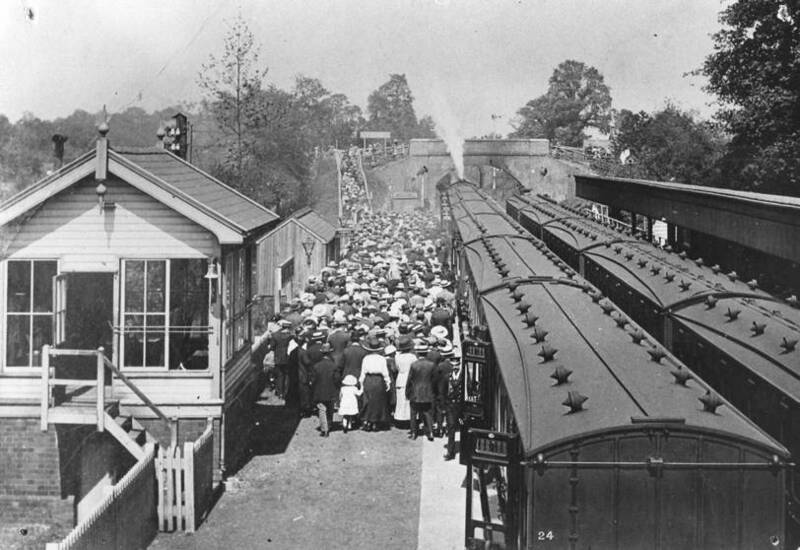 Trains continued to pass each other at Bricket Wood at peak periods and passengers were able to both enter and exit the ‘down’ only platform from the bridle path. On arrival of a train at this platform a ticket collector would be waiting there, but tickets had to be purchased from the main booking hall. To start the two train steam working, one service left Watford in the morning with two coaches in front of the engine and two at the rear. The leading two were left in St Albans to await the arrival of the extra loco, which was attached to one of the morning goods trains. Before the war there were also two, seven coach trains to London (Monday to Friday) from St Albans which were worked by either a class 4P Fowler 2300 or Stanier 2500 class tank. 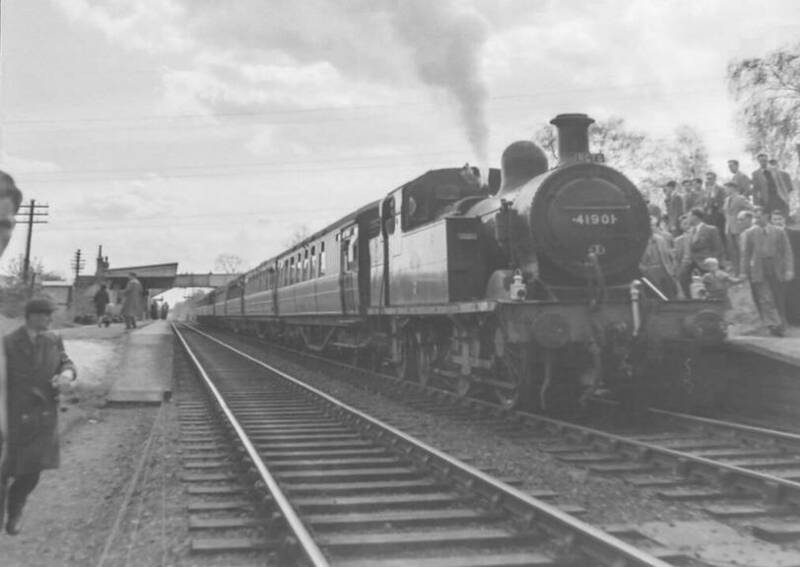 The trains were known as ‘residentials’ as opposed to ‘commuter trains’ and at St Albans the engine was required to run around the train prior to the journey to Euston station. Trains were scheduled at 7.47 and 8.37 every morning, but interestingly there were no ‘down’ trains in the evening. The 7.47 service continued into the war years, but this had ceased by 1945. A postwar view, 1948, looking every bit the idyllic country branch line station. The station gardens on platform 2 were always immaculately kept and frequently won ‘best kept station’ prizes. 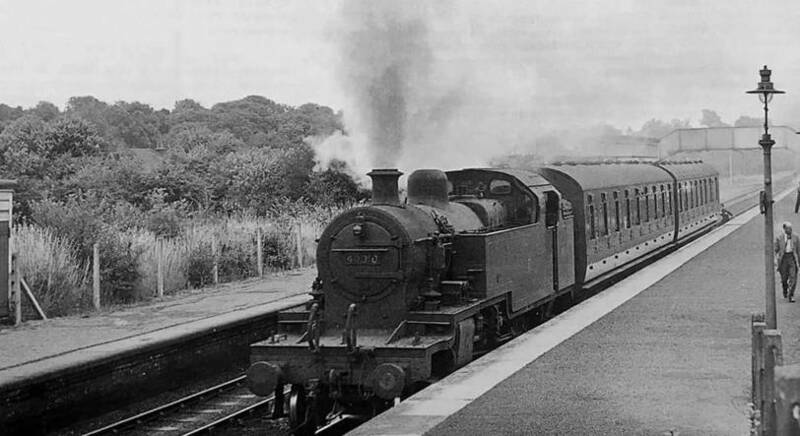 1947, and a two-coach push-pull train hauled by ex-LNWR 5ft 6in tank engine pulls into the station. It looks as though the train is heading towards Watford (engine propelling the train) judging by the direction of the exhaust steam. 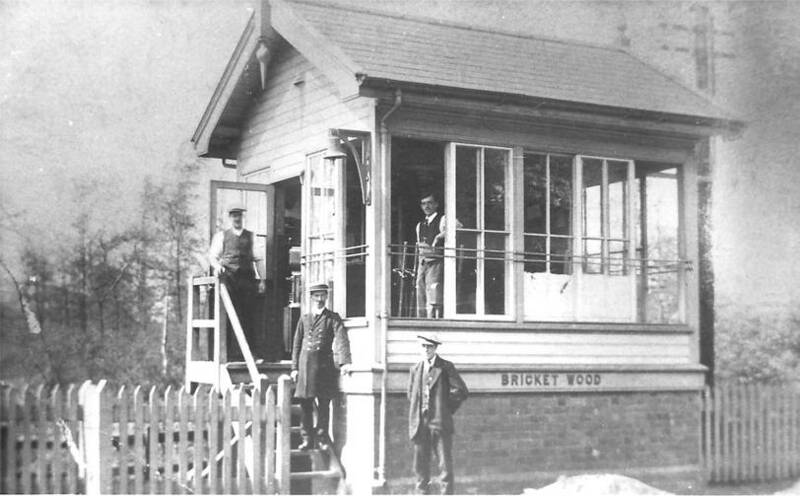 Mr Alan Ashberry, who worked as a fireman and driver on the branch around this time, remembers that Bricket Wood station had a signalman for each shift, one of whom lived in the company cottages next to the station. The signalmen at Bricket Wood took pride in their station gardens and on occasion people on the footplate were pressed into service delivering boxes of plants to the shedmaster at Watford. Booking clerks at the station had various duties which included ticket collecting, seeing trains off and any clerical work associated with freight traffic in the goods yard. During the peak evening rush hours and also on Saturdays a junior porter was sent to Bricket Wood to help out. The station also received a daily visit from the stationmaster at St Albans. Two ‘push-pull’ trains pass and exchange tokens, 1955. The wooded banks near Bricket Wood were home to several rabbits, which sometimes ended up in a railwayman’s stew pot. Mr Ashberry recalls that on warm summer evenings these banks were also a favoured spot for courting couples, in spite of the actions of some engine drivers and firemen who might subject them to whistle blasts, well aimed lumps of coal and spray from the slaking hose, depending on their sense of humour at the time. At the right time of year the banks were also lit with a soft blue light from glow-worms. More than once, the fireman or driver slowed the train to a crawling pace, jumped down off the footplate, collected some worms in a box and then hopped back aboard the engine before the passengers had time to figure out why the train had almost stopped. 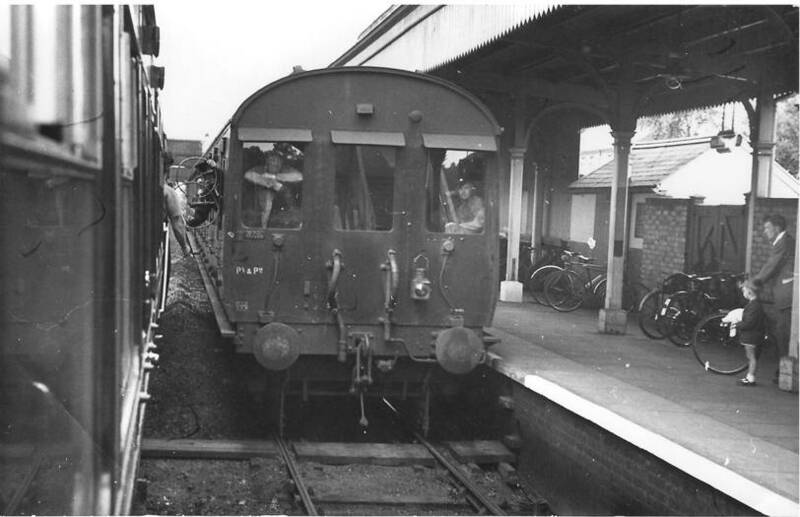 In February 1953 a three coach diesel unit comprising four wheelers was introduced on the branch, marking the beginning of a gradual phase out of steam. Initially, the coaches were silver in colour with a broad red stripe below the windows and they were driven by the manufacturer’s own drivers. According to Flt-Lt R.P.D. Sands the coaches were a real novelty and passengers were given a questionnaire in which to express their comments. They cannot have been very complimentary, as the four wheels of each coach had the tendency to go over each rail joint with a thump, the coaches swayed from side to side, there was no heating and in general it was ‘a shocking ride’. The only redeeming factor was the marvellous view of the line that the coaches offered, particularly in the Bricket Wood area. The coaches were withdrawn and re-introduced with modifications on 25th July 1955, in an olive green colour scheme with a cream line and black edging. However, they do not appear to have survived on the branch past 1958, at which time a two car DMU was put into service. A rather amusing article on their railcars entitled A (diesel) Rake’s Progress appeared in the December 1958 issue of Model Railway News. Two DMUs of the ‘Park Royal’ type (later Class 103) pass in the loop, 1960. Improvements in the branch line’s passenger service continued and by the end of the 1950s there was a total of 31 return trips from Monday to Friday, 37 on Saturdays and 22 on Sundays. The future of the line seemed assured. For Bricket Wood the late 1950s saw the building of a railway control centre next to the station for use in the event of a nuclear attack on London, as Bricket Wood was strategically located on several main telephone cables. The concrete building is still visible, although it was only operational till the mid 1960s. It has recently been utilised as a storage facility by a local building supplier. 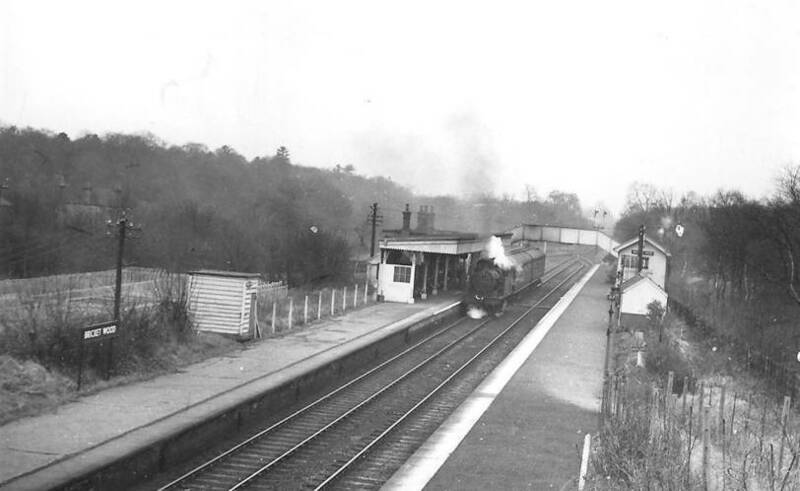 A ‘down’ train headed by a Stanier 0-4-4T pulls into platform 1, c. 1954. Note the foundations, to the left, for the bunker which was officially designated a Standard District Control Centre Type ‘L’. This building was intended as the dispersed location for the London Euston railway control room in the event of a nuclear strike on London. A peaceful scene, 1961. This photo shows to good effect the bunker, to the left, which was officially designated a Standard District Control Centre Type ‘L’. This building, completed c. 1954, was intended as the dispersed location for the London Euston railway control room in the event of a nuclear strike on London. The building of the Handley Page Housing Estate next to the ‘down’ only platform increased passenger traffic and resulted in the removal of some of the station gardens. The year 1958 marked the branch line’s centenary and on 27th April the Railway Correspondence and Travel Society ran a railtour over the line headed by Stanier 0-4-4T no. 41901. The year 1958 marked the branch line’s centenary and on 27th April the Railway Correspondence and Travel Society ran a railtour over the line headed by Stanier 0-4-4T no. 41901. Here it is seen heading towards St Albans Abbey. In March 1963 the Beeching Report on The Reshaping of British Railways was released. It claimed that the branch had lost some £24,000 per annum on its passenger service and therefore recommended that it be terminated. Public reaction was swift and vocal. For Bricket Wood residents in particular, a bus service did not offer a viable alternative. An article that appeared in the November issue of Railway World estimated that the number of passengers was between 7200 and 9200 per week. Staff on the branch averaged between 25 to 30 and were an increasing drain on the line’s finances. It was recommended that Watford North, rather than Bricket Wood be made the exchange point, that all intermediate stations become unstaffed halts, that the number of staff be cut back to 14 and that the track be allowed to decline to a goods only branch standard. It was only because of strong public pressure that British Rail took a serious look at keeping the line open to passenger traffic. In June 1963 the first economy measures were brought into effect with the condensing of passenger service into two working shifts, instead of three. However, the reduction in costs was not matched by an increased or even sustained level of passenger receipts. Further action was considered necessary and on 1st February 1965, single train working was introduced, with trains running approximately every 40 minutes. Prior to this, of course, two trains had run at twenty minute intervals during the peak periods. It was estimated that this move would alone save £12,000. Experiments were also made with the timetable and for a while there were gaps in the service to allow for the passage of coal trains to the gas works in St Albans. Numerous complaints were received about the poor scheduling and connections before the problems were ironed out. In mid April 1965 the stationmaster as Bricket Wood, Mr J. Bates, was transferred to Watford Junction. He was replaced by a relief booking clerk, Mr Chris Hemensley, whose duty it was to assist the staff of two signalmen, known as Bill and Ben. 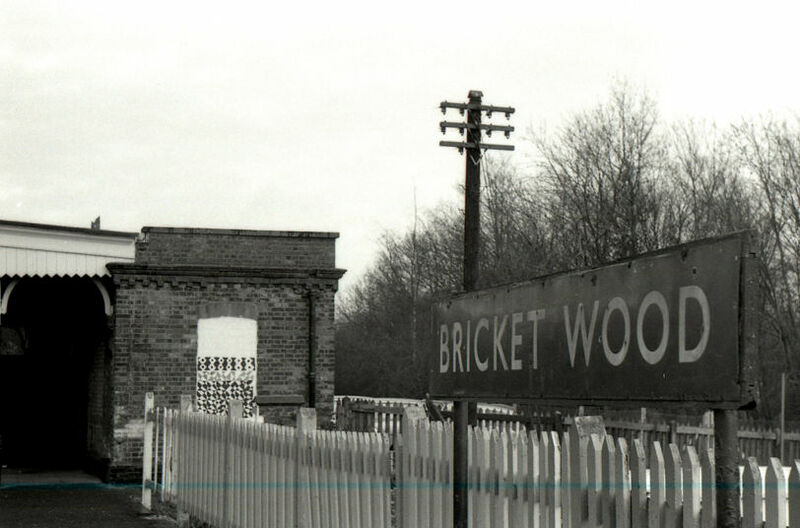 On 3rd May 1965 the goods facilities at Bricket Wood were withdrawn and in the same month Mr J. Holroyd, the stationmaster at Watford Junction, was given the responsibility for Bricket Wood and Park Street. Signal arms were removed and the passing loop was bolted shut. The signal box remained in place until October 1966 when it was demolished; the ‘down’ only platform later went the same way. The loop was also removed and the metal footbridge taken to Caledonian Road station on the North London line where it still stands today. The station canopy was shortened and the goods lock-up and lamp hut were removed. The goods yard was either sold or leased to the firm of Garston Supplies. 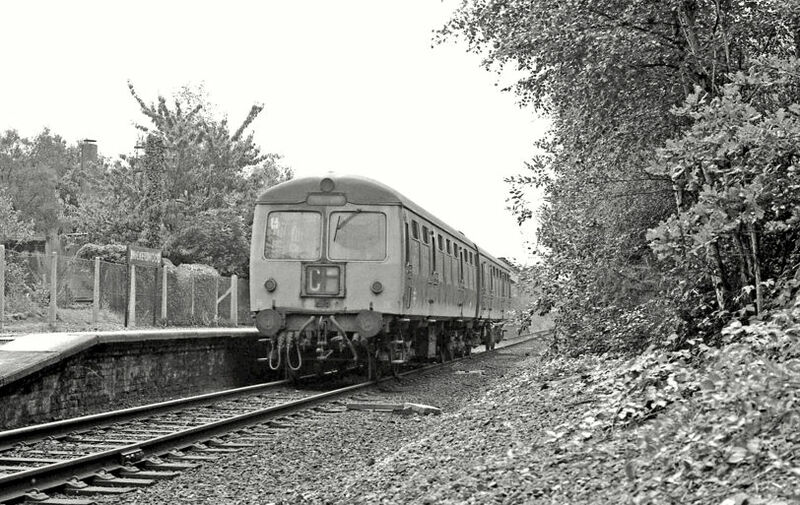 A Class 105 DMU waits in the station, August 1975. After closure, the main station building was boarded up and in the early 1970s it was bricked up, except for the main entrance, because of fire damage. This necessitated the removal of all interior partitions and chimneys. The branch line’s Sunday service came under the threat of termination in the mid 1970s with British Rail urging the travelling public to either ‘use it or lose it’. With financial support coming from local councils and improvements in passenger receipts the service continued past 28th March 1976, the date British Rail had set for a decision on the future of Sunday running. A scene of gradual decay, 1978, as a Class 105 DMU waits in the station. By now the passing loop, second platform and signalbox had all been demolished, the main station building was bricked up and it was effectively a simple, unstaffed halt, as it has remained to this day. In 1977 Venture Scouts did much to tidy up the station to commemorate Her Majesty’s Silver Jubilee and flowers were planted on the abandoned platform. Members of the Bricket Wood Art Club also painted wall murals on the platform side of the station depicting past scenes from Bricket Wood. These included the arrival of a train at Bricket Wood at the turn of the century, the helter-skelter and fairground, Miss Yule’s racehorses, a map of Bricket Wood and a train travelling over the Mount Pleasant Lane bridge at the turn of the century. 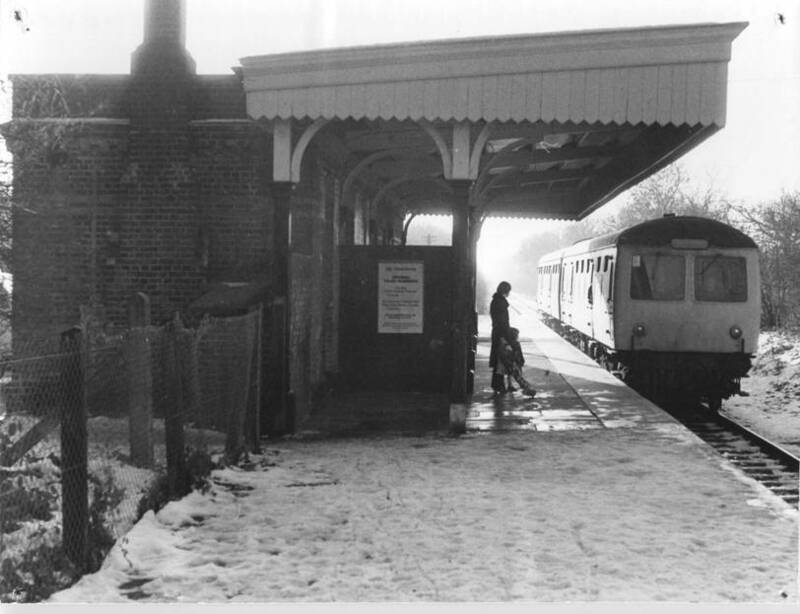 A Class 105 DMU waits in the station on a cold day in 1980. The wind-breaks are still in situ between the columns which support the canopy, but these were later removed, presumably to afford a minor improvement in security to passengers. The canopy at the St Albans end has already been truncated. 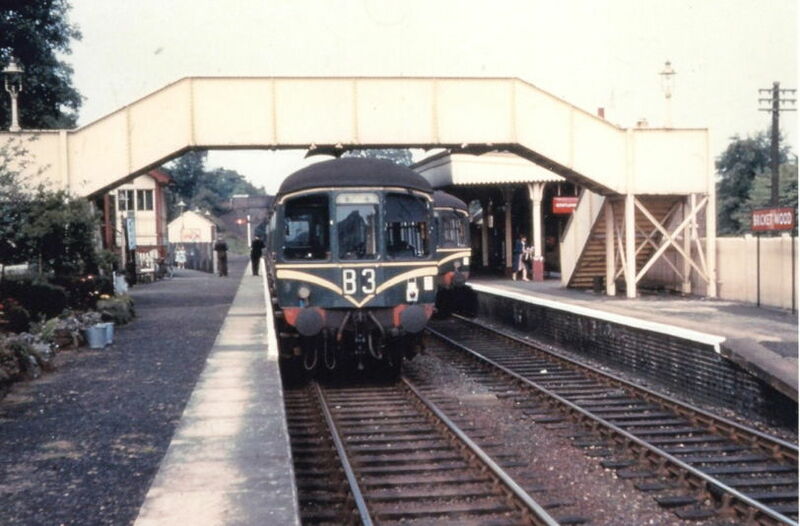 On 28th May 1983, Bricket Wood station played an integral part in the festivities organised by the Bricket Wood Society to mark the 125th anniversary of the branch line’s opening. 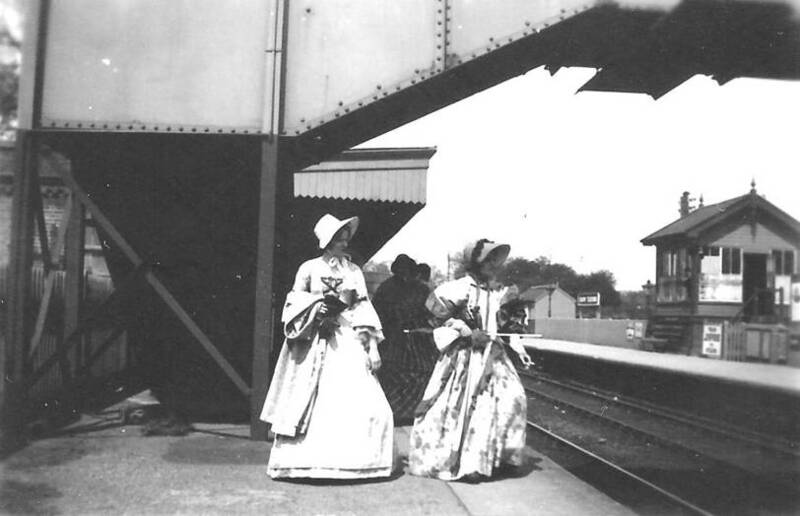 A special unit was attached to the two car diesel train and members of the Society, dressed in period costume, greeted the Deputy Mayor and Mayoress of St Albans, Councillor and Mrs Arthur Nowell, at the Abbey station at 1122. It was then off to Watford to pick up Watford’s Mayor and Mayoress, Councillor and Mrs Geoffrey Greenstreet. The train arrived back at Bricket Wood at 1212 and the company inspected the murals painted by the Bricket Wood Art Club before moving on to St. Stephen’s Parish Centre for a glass of wine and a buffet lunch. The station building, looking rather forlorn. The murals in the bricked-up doors and windows suggest that this picture was taken post-1977, when they were painted by the Bricket Wood Art Club to commemorate the Silver Jubilee. Rumours were rife in early 1983 that British Rail intended to close the line, but these proved totally unfounded with the opening of a new £400,000 bridge in August 1984 to span the M25 motorway just north of Bricket Wood. In July 1987 Graham Burling, BR’s Area Manager at Watford Junction, announced plans for a £675,000 scheme to electrify the branch, indicating without doubt BR’s long-term commitment to the line. The old station nameboard on the car-park side of the building. This survived in situ until the 1980s, and has now been preserved by a private collector, perhaps one day to be reunited with the building! 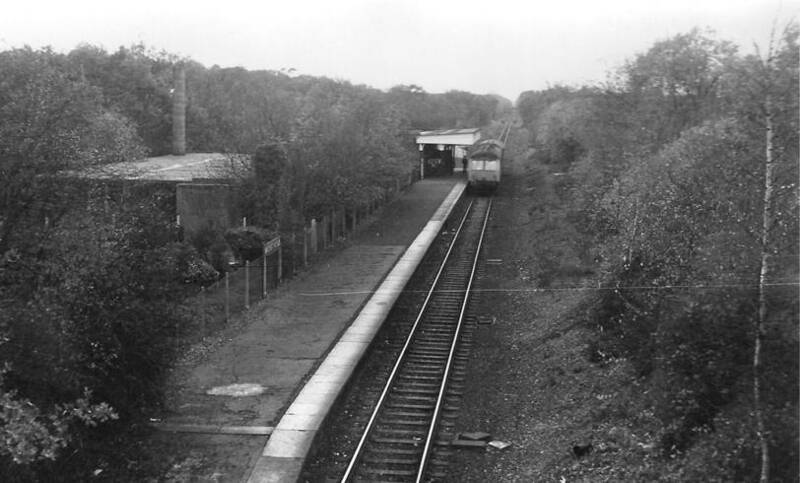 Passengers at Bricket Wood, as at other stations on the line, were advised that work on the project would begin on 5th October 1987 and last about five weeks. Peak services were not affected, but buses were laid on to replace trains from about 1000 until 1600 hours (Monday to Friday) and until early evening on Sundays. There was no disruption to the Saturday service. Cosmetic improvements were also made to the station at the time which included the erection of new fencing, the removal of wind breakers and painting of the canopy. Work was also carried out on raising the parapets on all bridges that crossed the line. Further disruptions to service followed in March 1988 with the erection of overhead electric gantries. Electrification was officially effective from 0001 hours on Monday 4th July 1988 and electric trains were in service shortly thereafter. In September of the same year a mirror was installed at Bricket Wood station to enable driver-only operation. Electrification brought about an improved timetable, with a total of 28 trains each way, Monday to Saturday and 17 trains each way on Sunday. There is some talk of through service to London and reinstallation of the passing loop at Bricket Wood, but these changes do not seem likely in the foreseeable future. 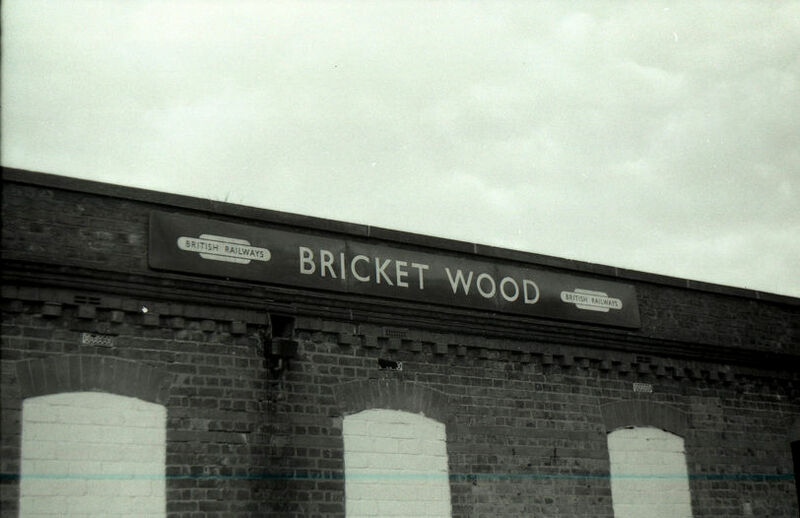 The station building at Bricket Wood is still standing and is leased by BR to a local building supplier. Even though the station is by no means the most attractive structure, it would be a great shame if it was demolished because of neglect, especially given the role that it has played in the community’s history and by the fact that it is the only building of historical significance left on the railway. Under the train operator ‘London Midland’, the station was painted green and black. This photo was taken in April 2015 by Peter Alvey. Mr Alan Ashberry, Mr R.J. Beattie, Mr Dennis Bradbury, Mr Greg J. Child, Mr Michael Clark, Mr R.M. Flanagan, Mr Rodney Hale, Flt-Lt R.P.D. Sands, Mr P.G. Scott and the BR Civil Engineer’s Office, Watford. Full name ‘Caledonian Road and Barnsbury’ station, the footbridge was scrapped circa 2010 as part of electrification works on the North London Line. Became Travis Perkins, but is no longer leased to them, it is nowadays just an empty shell.